Much of the 802.11ax draft amendment has been written with Internet of Things (IoT) devices in mind. The radio chipsets used for IoT devices generally need to be low-cost and consume very little power. Traditionally, Bluetooth and Zigbee chipsets have been cheaper to manufacture for IoT devices than Wi-Fi radio radios. However, 802.11ax lays the groundwork for vendors to manufacture low-cost Wi-Fi radios with better power-saving capabilities for sensors and other IoT devices. Target wake time (TWT) is a power saving mechanism originally defined in the 802.11ah-2016 amendment. A TWT is a negotiated agreement, based on expected traffic activity between clients and the AP, to specific a scheduled target wake-up time for the clients in power-save (PS) mode. TWT could theoretically allow client devices to sleep for hours. TWT is an ideal power-saving method for IoT devices that need to conserve battery life. We will provide more detail about TWT in a future blog. 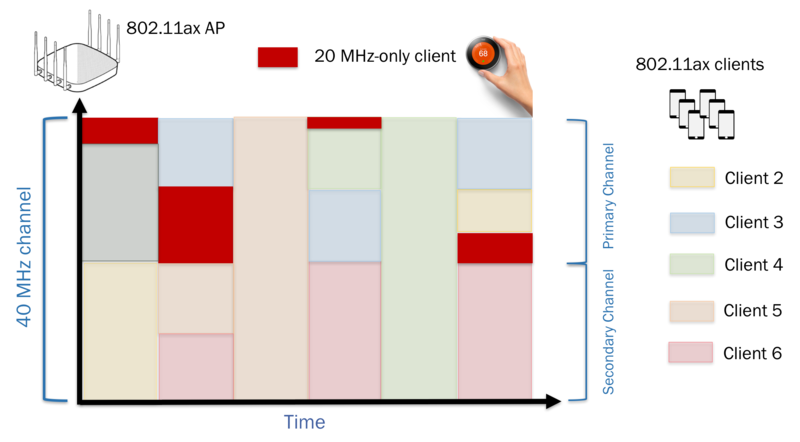 Another 802.11ax enhancement is a 20 MHz-only operational mode for 802.11ax clients. Via management frames, client stations will be able to inform an 802.11ax AP that they are operating as 20 MHz-only clients. A 20 MHz-only device can transmit/receive in either the 2.4 or the 5 GHz band. An OFDMA 20 MHz channel consists of a total of 256 subcarriers (tones). These tones are can be grouped into smaller sub-channels know as resource units (RUs). 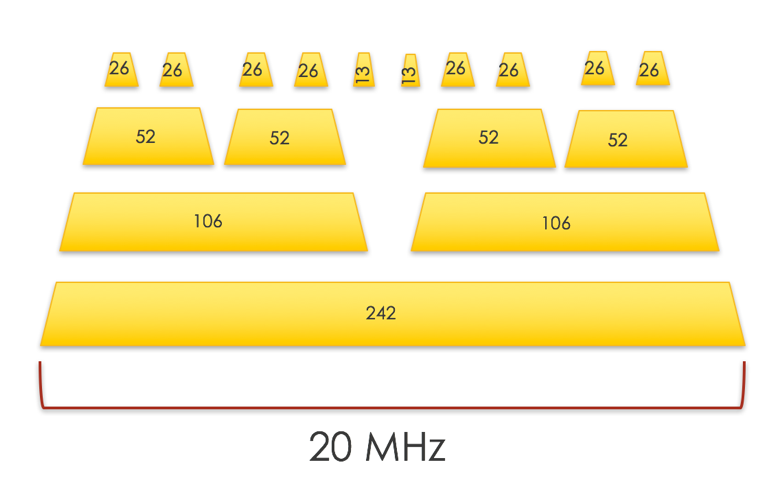 As shown in Figure 1, when subdividing a 20 MHz channel, an 802.11ax access point can designate 26, 52, 106, and 242 subcarrier resource units (RUs), which equates roughly to 2 MHz, 4 MHz, 8 MHz, and 20 MHz channels. By utilizing these sub-channels, an AP can orchestrate simultaneous downlink or uplink communications with multiple clients. An 802.11ax AP could assign any of these RUs to 20 MHz-only devices when the AP has also been configured for a 20 MHz channel. For example, the AP might assign 26-tone RUs and communicate with 9 IoT devices at the same time. If the AP is transmitting on a standard 20 MHz channel, the 20 MHz-only clients will obviously be able to support tone mappings of a 26-tone RU, 52-tone RU, 106-tone RU, and 242-tone RU within a 20 MHz channel. As shown in Figure 2, a 20 MHz-only client can still operate within a 40 MHz or 80 MHz channel width. However, with one rare operational exception, the 20 MHz-only clients must communicate via RUs the primary channel. If the AP is transmitting on a 40 MHz channel, the 20 MHz-only clients may support the 40 MHz tone mappings for a 26-tone RU, 52-tone RU or 106-tone RU. Very specific 26-tone RU, 52-tone RU or 106-tone mappings are also supported for a 20 MHz-only client if the AP is transmitting, within an 80 MHz channel. For any channels larger than 20 MHz, a 242-tone RU assignment is optional for 20 MHz-only clients. The whole purpose behind these rules is to ensure that a 20 MHz-only client is only assigned the proper OFDMA tone mappings and RU allocations that the client can support even if larger channels are being used. The 20 MHz-only operational mode is ideal for IoT clients that could take advantage of the 802.11ax power-saving capabilities but not necessarily need the full capabilities that 802.11ax has to offer. This will allow client manufacturers to design less complex chipsets at a lower cost which is ideal for IoT devices.